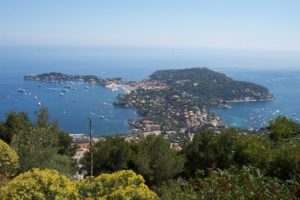 Villefranche-sur-Mer, renowned Côte d’Azur town, from the moment of yourarrival, be it by corniche road, by sea or by train, offers an awe inspiring panorama. with the constant variety of its colours, have made it the town of painters and artists. A maritime town in a privileged location, it has become one of the principal tourist ports of the Côte d’Azur, stopover point for many cruise ships, but remains a picturesque and ever-changing fishing port, shelter to a flotilla of small pleasurecraft and « pointus ». 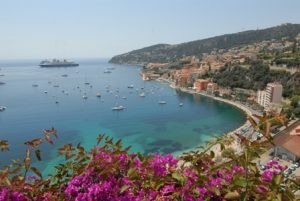 The charm of Villefranche is also due to the mildness of its climate, the environmental aspect that gives rise to the exuberance and spectacular display of its remarkable vegetation. 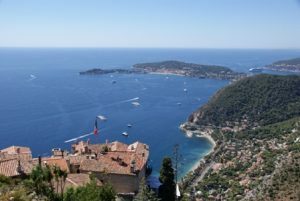 Lastly, Villefranche-sur-Mer is fortunate to benefit from a varied gastronomy combining local cuisine and fresh fish from the Mediterranean. Nice and Monaco and offers its visitors the charm of a protected site and the enchantment of discovery along three tourist footpaths totalling 14 km. A circuit along the shoreline permits exploration in a setting of stunning natural scenery where luxurious villas and magnificent gardens crown this Eden like precious jewels. The villa-museum Ephrussi de Rothschild is the most beautiful example – a veritable palace, constructed by Baroness Beatrice Ephrussi de Rothschild – it is sufficient reason on its own for an excursion. • The diving club, nautical centre and « SOS Grand Bleu » association offer seatrips and nautical activities. Beaulieu-sur-Mer has retained its unique architectural heritage, witness to the famous names and crowned heads that stayed there during the Belle Époque. Its beaches, fringed by a great variety of exotic plants, indicate the mildness of its climate. A park planted with more than 100 century-old olive trees allows the visitor to find beauty and tranquillity at a only few paces from the sea. 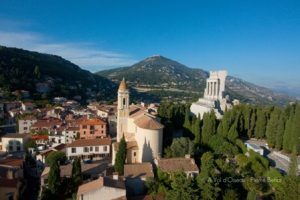 Beaulieu-sur-Mer offers all the advantages of the upmarket Côte d’Azur with its luxury shops, casino, quality hotels and restaurants which attract an international clientele. 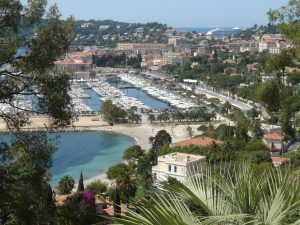 Beaulieu-sur-Mer, town of culture, has two large festivals, « Les Nuits Guitares » (Guitar Nights) and « Les Violons de Légende » (Legendary Violins). 800 boats, one of the most visited on the Côte d’Azur. (Our Lady of the Assumption) is remarkable for its numerous « trompe l’oeil » paintings. In the old seigneurial houses, artists find inspiration and artisans create hand-crafts from olive wood, leather and silk. Eze is an ideal place for shopping. It is also – from Provençal auberge to Michelin star restaurant, heir to the great tables of France a gastronomic destination. and completed « Thus Spoke Zarathoustra ». The Grande Corniche is an open area of Mediterranean maquis between sea and mountains : from its heights the view takes in a 360° panorama including, in winter, the snow-covered Mercantour, Corsica, Italy and Saint-Tropez. La Turbie, at the highest point of the « Grande Corniche », on the ancient Via Julia Augusta, is a true balcony suspended above Monaco. Its territory and rugged terrain (highly appreciated by hill-walkers) offers breathtaking and vertiginous viewpoints which have inspired poets and writers. This promontory position has conferred on La Turbie a strategic role since the dawn of time and shaped its unique history. The Romans chose the site to erect the monumental Trophy to the glory of Emperor Augustus, the counts of Provence transformed it into a fortress and the first Côte d’Azur winter visitors made of it one of their preferred destinations. If history and the passing centuries have undoubtedly transformed the village, it has retained its defensive character. Thanks to the richness and uniqueness of a remarkably well-preserved heritage, La Turbie offers numerous visitor itineraries, which can also be discovered with your Smartphone or on MP4 players available at the Tourist Information Centre. The local cuisine offered in the town’s restaurants will add considerably to the enjoyment of your visit. In Monaco, visitors can see picturesque traces of a heroic past stretching back over more than seven centuries because of the tenacity of the Grimaldi dynasty.